A chain smoking toddler has developed a insatiable habit - and puffs through 40 a day. Two-and-a-half year old Rapi Ananda Pamungkas started by picking up used butts outside his mum's market stall in Sukabumi, Indonesia. But within days he was hooked - and would constantly pester passing shoppers to give him cigarettes. The adults initially found the youngster's demands endearing and plied him with cigarettes while laughing as he lit up. But Rapi - nicknamed Rap - soon started becoming aggressive and throwing tantrums when he couldn't get his beloved ''meroko'', the local term for cigarettes. 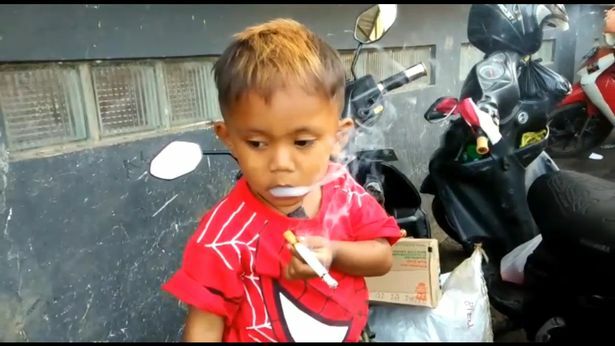 Rapi's mother , Maryati, 35, admitted on Monday that she buys two packs of cigarettes a day for the boy to stop him from going ''beserk''. She said: ''My child is used to smoking while drinking coffee and eating cake. ''He has been smoking every day for around two months. Maryati said that Rapi started around two months ago by collecting cigarette butts scattered on the road which older lads lit for him. After that, he demanded cigarettes from passing adults and his parents who run a food stall, which also sells cigarettes. The mother said that it had been difficult to ban her child from smoking because he will ''cry all day'' if he can't smoke. Maryati added: ''If Rapi doesn't get cigarettes he cannot sleep. "He will start rampaging and crying. "It's expensive, because we have to buy them for him. "He likes to do it all day. Rapi's father, Misbahudin, 40, said he also smokes but doesn't know why his child started the habit. He added: ''I cannot so no to him when he asks for a cigarette. "I don’t even smoke that often. "I only smoke at work. The parents said they will take the toddler to see a doctor to try and kick his smoking habit.